You are here: Home / Self-Publishing / Why are book editors so expensive?? Ooh, are you shocked? “But aren’t you One Of Them? ?” I hear you say. So, why? 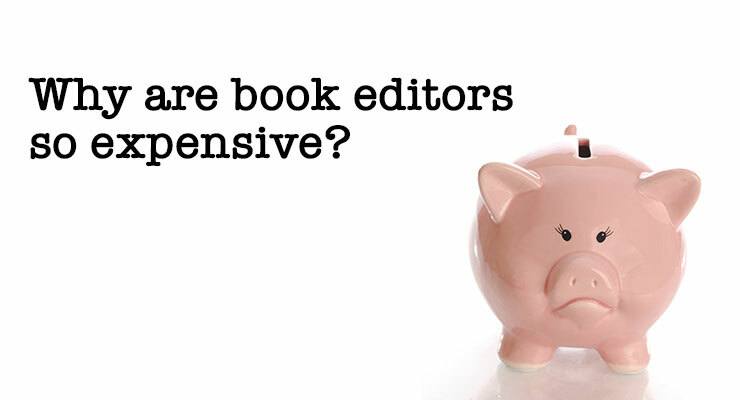 Why are editors so darn expensive??? Once upon a time, an author went to visit an editor, and dreamed of how they’d find them in a mansion, lazing by one of the pools. But when they arrived at the address, they had to look again and again. Now that you’ve stopped giggling about the track pants reference (sorry fellow editors, couldn’t resist), let’s ask ourselves: If editing is expensive, why aren’t editors rich? In all my years as a book editor — many of them freelancing — and chatting with other editors and authors, I’ve noticed two key misunderstandings about the whole process. I even failed to grasp the full range of implications myself for quite a while, so if you have been confused about it, you are definitely not alone! Let’s start with the first aspect of editing that tends to surprise people. It’s an understandable mistake. Who ever really knows what someone else’s job entails? To get a clearer picture, let’s break a book edit down into its components. So let’s say someone is going to read carefully (not just skim) your 100,000 word crime novel at 200 wpm. That adds up to about 8.5 hours just to READ your book ONCE. A quality edit usually involves two readings, at least. There are many cases where this doesn’t happen these days, due to financial and time pressures — but it’s the ideal. In fact, I used to give manuscripts 4, 5 or even up to 7 passes when I was on staff with a specialist publisher. So at that 200 wpm rate for careful reading, we’re up to 17 hours for two passes through the manuscript. They’re not just reading, however. They’re writing as well… perhaps with a red pen on a printout, or by making notes on an electronic copy. They also need to take the time to express themselves clearly in those notes, to ensure the author will be able to understand the logic of the comments and have enough information to make well-informed decisions about the recommendations. As well as all this reading and writing, editors are also doing other tasks, depending on the editing phase they are tackling. A content / developmental / structural editor needs to read and think creatively, evaluating the book and where it’s heading and where it could go instead to make it a stronger book. They can often read fast as they are looking at the big picture rather than the small detail, but the creative side needs some time to breathe. If they’re writing a report, it needs to be carefully put together, drawing together those possibilities for the author in a way that is accessible and actionable. If they’re doing the actual restructuring/redeveloping, that will obviously take even more time. Lots more time. Believe me, I’ve done it, and it’s a time-gobbler. They might be required to check sources, depending on the brief. While they do all this, they need to think analytically, weighing up not just correct-vs-incorrect, but also ok-vs-better, in a range of areas including spelling, grammar, punctuation and expression. A proofreader also needs to read every single letter of every word, every punctuation mark, every page number and running head, check for consistency of heading levels and that nothing is missing, possibly check references within the text depending on the brief, and make an instant judgement call on accuracy. So, about how many hours is that? So that’s averaging around 1 hour per 1000 words of manuscript! Hmmm. Seems like they are in the same ballpark, doesn’t it. Is that slower than you thought? Go on, you can tell me. I suspect that many books today are NOT getting that level of editing due to budget cuts and other factors, but when I started in book editing back in the mid-90s, that was certainly the intensity of editing that our projects were getting. Yes, it’s a big job. I’m talking from my personal experience as a specialist non-fiction editor, rather than making declarations about the publishing industry as a whole. And I know that in my sector, publishing houses are tending to squeeze the amount of time their editors are allowed to spend on a project. If any fiction editors are reading this, I’d be interested to hear your thoughts. What do you think is an ideal amount of time to spend doing a really good fiction edit? Are CMOS and the EFA about right, or not? How does it vary between genres and into literary fiction? And have there been changes in publisher expectations in your section of the industry in recent years? Many self-publishers would have trouble affording a 100-hour edit. I’d have trouble affording it for my personal project, at professional rates. NEXT WEEK we’ll move on to Chapter 2 of this little story — the second aspect of the cost of freelance editing that catches people by surprise. Can you guess what it is?? EDIT: Chapter 2 is now live, and you can check it out here. Are you surprised by the quote from the Chicago Manual of Style? As a writer or an editor, what is your experience with the amount of time a book edit takes? Excellent article, Belinda! Thank you. It’s useful to see the job broken down like this. Even publishers seem unaware of the time it takes to do a job properly (unannounced 100,000-word book for proofreading in inbox on a Monday evening, for return Wednesday morning …). The second aspect of the cost of freelance editing has to be the purchase of chocolate biscuits – there is a direct relationship between the complexity of the manuscript and the number of biscuits needed to get through it. And oh yes, I know what you mean about publishers who remain blithely unaware. I hope you were able to negotiate some sanity into that proofreading job!! Wonderful insight. I know I was hoping hiring an editor would be less expensive and that my manuscript would be discounted because I’d had so many beta reads and self-edits, but I now understand the time involved and you editors deserve every penny. It’s a bit of a conundrum for the struggling writer, though. Best advice I heard is when you start writing your novel start putting away money every month, so when you get to the end, you have money to hire an editor, (and cover artist if your self-publishing). I wish I would have had that advice. Now I feel like I’m in a holding pattern while I save up the money for a professional editor, but I’ll get there! Tam, I feel your pain, I really do! I’m in a situation where I couldn’t afford to hire me. 😉 But we will get there! Great piece, Brenda. Love the editor’s hovel. 🙂 I worked as an editor–both freelance and for a publishing company–and I’m always amazed at how many writers don’t have a clue what editors do. Some think they’re glorified spell-checkers. Others think they can magically turn a bunch of raw scribblings into a masterpiece. One potential client actually showed up with a bunch of cassette tapes from interviews she’d done on various topics and wanted me to make them into a book–at editing rates. Sigh. Yes. editors can do a lot, but they can’t write your book for you. If they do, it’s called ghostwriting, and that will cost a whole lot more. Anne, glad you liked the pic of my house. 😉 I can’t believe you’ve used the phrase “glorified spell-checkers” as that is in next week’s article!! Great minds think alike, and all that. I’m also a freelance editor and I word for an Australian publisher. Editing is not as easy as many people think. It’s actually quite exhausting at times, yet very rewarding most of the time. You’ve put together a very accurate article, even to the house where I live! :-p I am definitely sharing this and look forward to the next installment. Thanks Serena, we must live in the same subdivision?? Do you think the timeframes are comparable for fiction? Always interested to know about the experiences of other editors. Great blog, Belinda. I’ve already been through the process myself recently with my latest book. I paid $3000 for the editing of my 85,000 word manuscript. Can you let me know if that was a fair price? And while I write the next book, I’m pondering the potential cost of having it edited, something I will definitely NOT forego, but secretly hope to find an editor who subsists on the same bread and water as this writer does, and the occasional (or not so occasional) bag of chips or chocolate block. Greg, using the EFA rates http://www.the-efa.org/res/rates.php I calculate that for heavy copy editing on a ms of that length, you’re looking at a range between US$2720 and $8500 for a US editor. (And the recommended hourly rates are higher in Australia due to the higher cost of living.) So yes, it does sound like you got a fair price, especially if you were happy with the editing. Sometimes you can find an editor who’s just starting out and wants the experience, or perhaps someone who’s retired and doing it as a hobby, and get a cheaper price. p.s. are you the Greg Smith I used to work with in Sydney? Thanks Belinda, I did a good deal of research before committing myself to that copy editor and had a sense that it was a fair price. As for being the Greg Smith you once worked with in Sydney, I’m not sure (my memory fails me at times). I used to work in the printing and publishing industries in Sydney. Where was it that you worked with ‘your’ Greg Smith? So well said, Belinda. Thank you for initiating the discussion. I’m a professional freelance editor based in the UK. I specialise in working with self-publishers and am careful to track the time I spend on manuscripts. In my experience (the 4-5 years since self-publishing became a thing), 1,000 words an hour is about right, once you take into account the other bits that go along with the actual editing – creating stylesheets, character lists and chapter-by-chapter synopses, email hand-holding and, sometimes, reading previous books in a series so there is continuity with the next in the series. Editing is very time-intensive, but the hourly rate an editor charges also reflects the years of training and reading and experience that they bring to a writer’s work and I think it’s important that authors – especially self-publishers – understand fully the value we bring. Editing (and proofreading) is largely invisible to most people (readers and writers) when it’s done well. It’s one of those skills that people only notice when it’s done badly, or not at all. Thanks for your very useful blog posts. I’m tweeting them like mad! I love your point that good editing is invisible. Yes! It enables the author’s voice to come through clear and strong. I sympathise fully with the budget constraints that hold many self-publishers back… but I can always tell the self-published works that have had professional editing. They are tight and clean, no dross. And they are indistinguishable from the best of the traditionally-published books — which is my own goal in self-publishing. Thanks for your excellent, very thorough article, Belinda! As a freelance editor specializing in fiction, I also advise on effective point of view, characterization, pacing, plot points, logistics, and other big-picture issues, as well as increasing reader engagement by adding tension, suspense and intrigue, and improving the flow of ideas by cutting down on wordiness and streamlining their writing. As one who works as a freelance editor, I have to say that I appreciate this post greatly. I know full well that I under charge for my services, but I still get folks saying that I am asking for too much. And when I try to explain to them what goes in to my work, they give the same response you made above, “But you easily read books in 5-6 hours, don’t you?” Sigh. Cameron, I think one of the things that happens (with me at least) is that when they say, “Oh it won’t take you that long,” I tend to BELIEVE them! What is that about? I’m the one who knows how long it takes, and yet I yield. I’m doing less of that now, however, because that is the path to ruin. Best wishes for your editing career! I’ve had this same experience, both the squeeze in the nonfiction end of things, and the disappearance of writers who want a copyedit basically for nothing. I decided not to do any editorial support work for self-publishing authors after the first one vanished when I quoted the very lowest page rate I could. Apparently, there are copyeditors who will do the job for a dollar a page. I will not be one of them. I have too much desire to see a thing done right and I am not a charitable institution. Yes Lily, you deserve to make a living! I’ve made a decision this year to be business-like and stop doing “charity jobs” that leave me struggling to eat while my clients live comfortably. I’ve realised that it wasn’t their desire to make me poor, they simply didn’t understand. So now I explain, and while many clients disappear when they hear the price (which is fine), some stay and they are such a pleasure to work with. 🙂 Onwards! Great information! I’d love to see a version of this to share with potential clients. Can anyone point me to one? For various reasons, including the fact that some of my authors are on the other side of the globe, we have moved all of our editing sessions online, mostly in Google Drive. I advised the authors to set up at least 10 two-hour sessions for this process. It can sometimes take longer than that, depending on the level of editing required; for the most part these are very clean manuscripts that have had extensive revisions applied already. When it comes down to the proofreading level, I found the proofreading tools in Word and Apple’s Pages quite useful and time-saving; I would heartily recommend everyone use them. Just don’t depend on them entirely. They won’t provide you with a manuscript suitable for publication. Excellent article. I’ve been working on a nonfiction manuscript and lost count of how much I have paid for editing services and I’m still working on the book. I understand the reason it cost so much for this service. I’ve done freelance developmental editing in fiction, and yes, your math of 1000 words an hour is about right–especially at the beginning of the book. I’ve noticed that the first couple of scenes are often the roughest, probably because we fiction writers need to cram so much into those first 20 pages. If I was less picky about the clients I take (my clients are all highly skilled and knowledgeable in the craft), the math would likely dip closer that 250+ words an hour range. I’m one of those developmental editors who give comments in the manuscript itself, so I easily end up with 200-400 comments, several of them half a page long. In addition, I write up a several thousand word editorial letter, detailing the strengths and weaknesses of the story, plot arc, character arc, pacing, theme, etc. So the 1000 words an hour applies to the time it takes to write up the comments, but it doesn’t include time for the editorial letter itself. It often takes me two full days just to gather my thoughts about what the story needs and write up the letter. I love helping people with my editing, but it’s HUGELY time consuming. I’ve had to become very picky with the clients I take on because it’s not worth it for the money alone. I have to WANT to work on the story and work with the author. For some situations, no money makes it worth my time and effort. Thanks for providing this insight! Oh, and as you pointed out, we usually do more than one pass, and I always go through my in-manuscript comments one extra time to make sure they all make sense and aren’t too harsh. So yeah, over the whole project (reading, commenting, multiple passes, editorial letter, etc. ), it easily works out to 250-1250 words per hour. Feel free to link. I think I’ll probably be including this link in a few future emails too! Thanks for taking the time to give us insight into your process, Jami. Whether fiction or non-fiction, I work on hard copy and make comments for a structural read-through, then type them up with general remarks about patterns for author’s self-editing regarding language and voice and POV. I send both in advance of a sit-down (or skype with clients overseas) for 2-4 hours to “arm-wrestle” so we are both in agreement with the reader’s perspective, which is the position an editor has to hold at all times (and then relinquish the conversation to the author’s obstinacy). Gosh, I never realized how much on-the-job training we give our clients! I’m delighted by all the editors’ feedback on this blog post. I often feel I’m working in a vacuum – it’s gratifying to be in an international conversation from San Francisco, blessed as we are to have a core of strong editors with different expertise offering 10 minute consultations at the San Francisco Writers Conference. The breadth of experience this conversation has invoked reminds me how frustrating it is to talk with a client who doesn’t understand that our hourly rate has to cover running to the office supply store; talking to potential clients; talking to our on-going clients (“Short” conversations, for which I don’t bill, can run 45 minutes once our minds link up in exploring all the options about a simple question); blogging to establish visibility (and because we love to have an opportunity to do our own writing); waking at 4 a.m. with an insight about how to resolve a structural conundrum and not being able to fall asleep again, but too dopey to pick up a manuscript that would generate billing; billing and tracking billing – the myriad aspects of running a business that employees are paid for and freelancers are not. Ah yes, David, all those other things we have to do to run a business. They are my “Chapter 2” of this stream — so important and yet so little understood! Thanks for joining the discussion. The Australian/US exchange rate is also not helpful, although it may not be quite so difficult as SA/US. But another problem I have when quoting for my work is that people expect to pay US rates. But the cost of living is 60% higher here!! Ah, it’s a wonderful global industry we work in… Best wishes for your writing and your great relationship with your editor. My gratitude for your article, Belinda (and for my friend Joel for picking it up). It’s easier to send this to my clients than to try to defend the expense myself. I do one at a time, estimating the read-through first, and not addressing cost of the text editing until the structure is repaired. I always give potential clients a firm maximum estimate, so they can decide if my work fits their budget. I actually bill hourly, which usually comes in under the estimate (which makes them feel good) – or if I go over, I eat beans and rice for a week instead of greens and fresh fish, since that’s not their problem). However, it takes at least an hour to work up that estimate – which is free. That hour gives me the opportunity to tell a writer if their project is hopeless and suggest writing groups to reinforce that, or writing classes. Sometimes I refer them to other editors – if I’m not attracted to the content (anything violent) or don’t have expertise (or interest, e.g., genre writing). I edit non-fiction and fiction, as well as dissertations and memoir. A structural read-through of non-fiction can vary widely in time per page, depending on both the clarity of the writing and the newness of the concepts to me. For a general market non-fiction it’s useful for an editor not familiar with the subject to work on it – if an editor with my 25 years of freelance experience can’t understand it, the target audience won’t either. The estimates you reported are around my range for fiction, but will vary with the capacity of the writer to write (and be understood) and the extent of comments required. When I do a structural edit, I also include several pages of intensive editing for voice and richness of expression as a model for what I expect clients to do after I’ve returned the marked up MS. (or what I will do in the second round of editing). Some of my colleagues locally work on a standard per page or per word fee, but I find that each manuscript has its own challenges – and the financial agreement between editor and writer should reflect that. Again, my gratitude for this conversation. Thank you David for these insights into your process. Editors are far more than spell-checkers, as you have demonstrated. I also have trouble doing standard per page rates, as manuscripts vary so widely. I think that often editors are posting their per page rates simply to meet market pressures. However, I keep a careful log of how long each project takes now, so that I can work out some averages, as that certainly makes it easier to prepare a proposal, anyway! Reblogged partial and linked back here: http://indiebooksgonewild.blogspot.com/2014/07/something-needing-to-be-shared.html Thank you for sharing this. So many times people balk at our prices! We’re strictly line editors and proofreaders, and it’s difficult at times to help authors understand why editing their book takes so long. WRITE ON! A fine post, Belinda–I’d say you’re spot on. As editor of Panverse Publishing LLC, and a freelance editor as well, I find a simple copyedit with some light stylistic editing on a 100k-word novel can easily run 40-60 hours. You do need to catch every single misplaced or omitted comma, as well as watch out for consistency, cliches, logical holes, etc. etc., and, yes, be thoughful, collaboartive, and polite in your inline comments or notes to the author. At the end of an average 100k ms I’ll typically have a thousand or more tracked changes and a hundred–sometimes two hundred or more or more inline comments. Of course, some very experienced and professional authors will turn in far cleaner mss., but it’s definitely not the rule. Thank you!!!! And the amount of estimated hours on a manuscript is about right, and that’s assuming that the writer is English or at least has good command of the English language. I’ve done 4 books – one stand-alone and one trilogy – where the writers were using English as a second language and the initial pass wasn’t even editing is was seeing where their language’s syntax clashed with actual English and reworking the sentences into proper English before even getting to proper grammar and punctuation, etc. That adds significantly to the time and the cost. I actually charge for the second read and sometimes the third (at a discounted rate compared to the first full edit) especially if they add a lot of new material because it still takes a lot of time to do the second and third readings. I, too, have done up to 7 or 8 readings on a book if there were little piggledy things to work out. Thank you, Belinda. You really broke it down so nicely, offering very simple explanations about pricing and details about what actually goes into editing. If enough writers read this, and other blogs like this, maybe they’ll gradually stop asking editors to work for so little. Of course, no one “needs” to hire an editor and not everyone can afford one. But this’ll at least let some writers understand that they are asking editors in many cases to work for below minimum wage (it gets really sad when established publishers do this). I have been a professional freelance editor for about fifteen years and I read this thread with amazed recognition. I thought I was in a minority, but no. I charge by the thousand words, mainly because if I quoted the hours I work, I would be earning round about the minimum wage here (Ireland). The thousand words are the writers’, as my finished work is sure to be less wordy. I work on line only and was one of the first to do so. I have had enough success to be picky and turn down the jobs more suited to a (patient) ghost. New writers tend to be more sensitive than those who have published books already and there are some who are next to impossible to please. Editing a second book for the same person is likely to be a breeze by comparison. I learned to edit from my friend and publisher, Diana Athill (André Deutsch) and did some work for her. I quickly decided that on line was a better idea and now I wouldn’t dream of editing from hard copy. Excellent points, but I draw the line at “their track pants.” Did the author and editor own, or were they perhaps both wearing, the same pair of track pants? Re: “their” — I am well reversed in the “debate.” I don’t care. To me the issue is clarity, and for me it generally clouds the issue, as I pointed out in your statement, when you mentioned to people, then said “their,” which would refer to both people, not one of them. Had you left out the word, the owner/wearer of the pants would have been self-evident. Great article, Belinda. I’m particularly interested to read your assessments on required number of reads, and hours maybe spent on a manuscript. I’m a traditionalist, trained and experienced as a writer and editor in the old ways, and with the introduction of e:publishing I’m finding the standard of mss dipping so low that I could easily spend twice the time you state just trying to get my head around an author’s ideas, and wrestling with very poor grasp of the English language. Excellent article, Belinda! You’ve put together a very accurate article. it is very useful to me. I estimate 40 hours for a Developmental Edit and 80 for a Copy & Line Edit on a manuscript of 80,000 words. It would be 50 hours for a Dev Edit and 100 hours for a Copy & Line Edit on a manuscript of 100,000 words. So, exactly what you’ve proposed. I have a detailed process for Dev Editing, walking the writer though the process of transforming an exciting idea into a full scene-by-scene novel, The draft they send me is mostly just background material on their skills and intentions. I ask them a bazillion very specific questions over the course of some weeks, revealing the protagonist they truly envision and then “:growing” the plot out of that character, I teach every client how to tell the story they really want to tell–lessons that they carry with them into all further work. The next phase, Line Editing, is one of those things that takes years and even decades to learn. There are a lot of techniques that can be taught to make it easier, but in the final hour it’s the editor’s love of language that makes it just right. And I throw Copy Editing in free with Line Editing. I never do a Copy & Line Edit on a manuscript on which I have not yet done some form of Developmental Edit. It would be cruel to take a writer’s money to polish scenes that are not yet finished or properly placed or might not even belong in this particular novel. It’s a wonderful career. And I have fabulous relationships with my authors. But experienced editors are, indeed, expensive. And worth it. Thanks Victoria. Glad to hear the CMoS estimates are pretty much on target for fiction too. And it sounds like your clients get wonderful value from the process of working with you. I also find it can be quite intense. Best wishes for your continued career!